There's nothing quite like summer cruising in New England. Silent misty mornings interrupted only by the distant clang of a buoy, cobblestone streets whispering history's secrets and rugged coastal cliffs that make even seasoned sailors wary blend together to create the perfect mÃ©lange that defines this beautiful northeastern region. 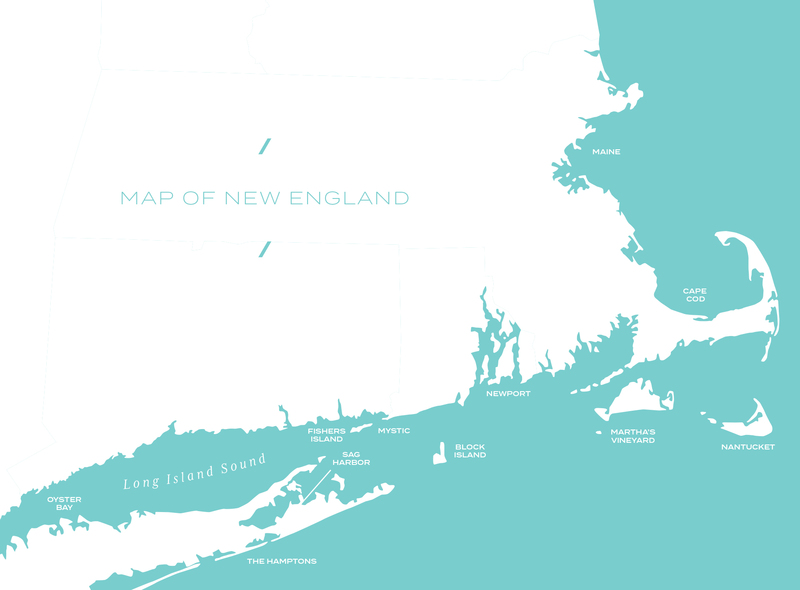 From The Hamptons to Boston, the New England coastline awaits. Stretching out into the Long Island Sound, The Hamptons comprise the area of Southampton and East Hampton at the end of the island. Just a 90-minute drive from Manhattan, these villages and hamlets have long enticed the city's elite with their dramatic beaches, stunning summer mansions, and countryside vibe. 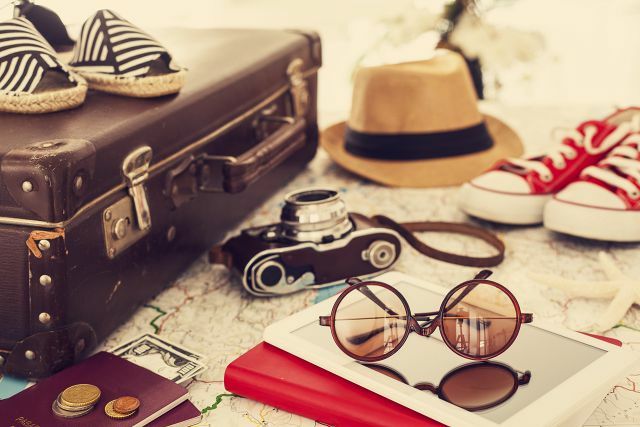 Bursting with quirky shops, antique dealers and enticing roadside stands, The Hamptons will melt your heart with a slice of summertime rhubarb pie and captivate your spirit with its endless offering of festivals and celebrations. Situated on Long Island's north shore, the quaint hamlet of Oyster Bay is where you'll find the Sagamore Hill National Historic Site, once home to the town's most famous resident, Teddy Roosevelt. Oyster lovers will pine for the annual summer Oyster Bay Festival. This seaside village offers an enviable array of shops, galleries, spas and activities as well as a thriving dining and nightlife scene. Centrally located in the casual-luxe region of The Hamptons, the tiny village of Sag Harbor is rich in cultural activities and takes great pride in its heritage, having been both a whaler's port and writer's colony. Here you can take a guided tour of the Marine Park and visit the gourmet shops, boutiques and restaurants that line Main Street. Discover the Sag Harbor Whaling and Historical Museum to learn more about this town's history as the first commercial port in the U.S. Don't miss a comedy show, musical or special event at Bay Street Theater, a playhouse that rivals Broadway in its productions. Nestled between New York and Boston, this popular vacation destination offers something for the whole family. Explore the charming Mystic Seaport with its maritime museum, shops and delightful dining options. The Mystic Aquarium offers indoor and outdoor exhibits with exotic marine life from the world's oceans. Just a short drive away are the famous Mohegan Sun and Foxwood Resort casinos. The Mystic Bridge historic district offers its share of dining, shopping and nightlife, sprinkled amidst the classic New England clapboard-house charm that begs to be explored. 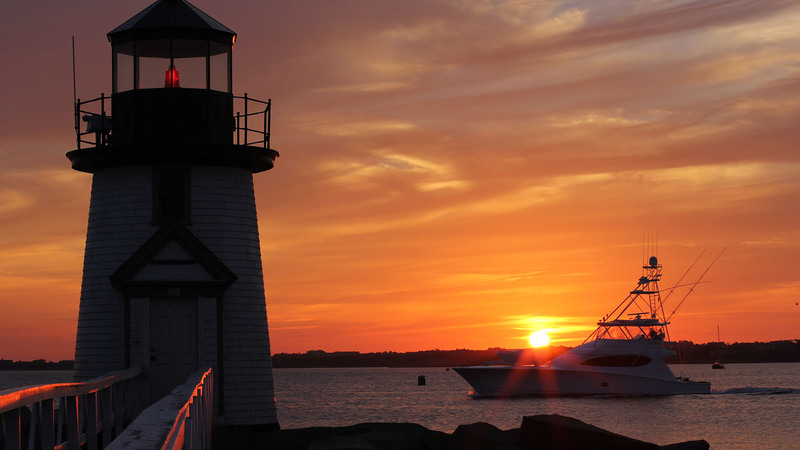 Dotted with charming fishing villages, breathtaking anchorages and bustling cities, Rhode Island's most popular yachting destination is Newport, a town dedicated to seafaring. Do the Cliff Walk past the palatial mansions overlooking the crashing waves below and sip wine and slurp oysters at any of the many upscale restaurants that line the water. Newport is home to many summer festivals and regattas for boats large and small and has played host to the America's Cup races as well. 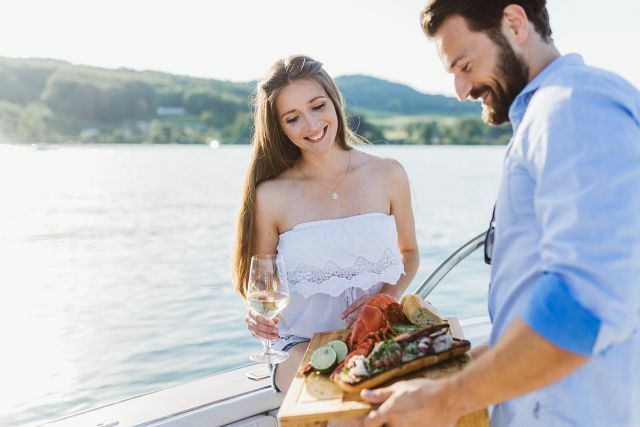 Don't miss the opportunity to brunch at Castle Hill or indulge in a private clam bake at Rose Island. 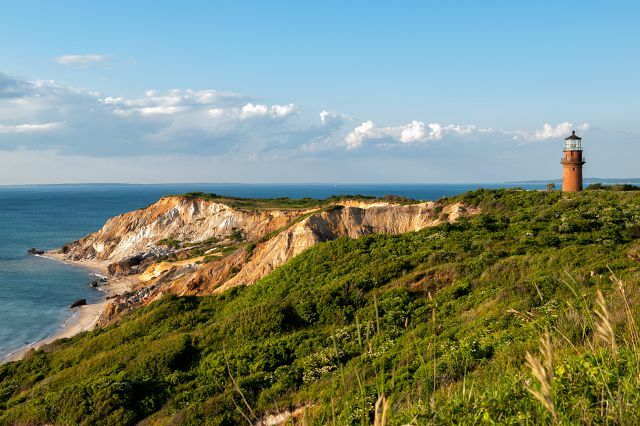 Dramatic cliffs, 17 miles of beaches, and iconic lighthouses, Block Island feels like a world away. Rent scooters to explore this island via scenic country roads that take you within view of spectacular bluffs, sand dunes, and incredible landscapes. Jump in the ocean from one of 'Block's' fabulous sandy or rocky beaches, or go fishing for striped bass. Tour the lighthouses. Perched on a hill, The Atlantic Inn is the spot to enjoy the sunset and a glass of wine from the Adirondack chairs on the lawn. Lighthouses, farmers' markets, colorful gingerbread cottages... Martha's Vineyard is the quintessential New England destination. Tour the Edgartown harbor to view some of the most gorgeous homes in the nation. Take a bike ride past the the cute homes in Oak Bluffs and snap a photo of one of the many beautiful lighthouses at sunset. From the beautiful beaches to old world taverns and world-class spas, every aspect of Martha's Vineyard begs to be explored and enjoyed. Just off the southeastern coast of Connecticut, Fishers Island is a private seasonal resort island that offers a quiet pace and natural splendor. The once-thriving lobstering community still boasts several lobster businesses and the Fishers Island Oyster Farm, established in 1959, is the island's only major farm. Attractions include a marina, museum, yacht club and golf course. Embodying the small-town feel of yesteryear, the one-mile-wide by nine-miles-long Fishers Island is a hidden gem of Americana worth discovering. Once a major whaling port, the tiny island of Nantucket now boasts well preserved cobblestone streets leading to opulent mansions, antique stores, art galleries and elegant boutiques. Try surfing off one of the many beautiful beaches or explore the towns outside the Nantucket Boat Basin, all of which are accessible by a network of bike paths. Nantucket offers a wide variety of cultural activities, from live jazz to summertime festivals, theater, lecture series and more. The hook-shaped peninsula of Cape Cod is popular for its charming villages, seafood shacks, countless ice cream shoppes and endless water-based activities. Follow the Kennedy Legacy Trail that begins with the John F. Kennedy Museum and meanders through downtown Hyannis. 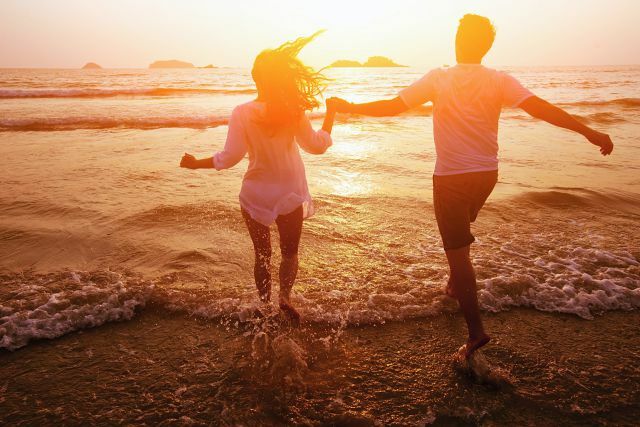 As one of the world's most romantic destinations, Cape Cod offers everything from beach combing to mini golf for the kids to fishing and regular golf for the adults. Visit an oyster farm, tour the Maritime Museum, catch a movie at the drive-in theater. The options are endless in Cape Cod. Walk in the colonists' footsteps and wind down with a cup of "chowda". This vibrant, thriving city is renowned for its cultural facilities, world-class educational institutions, and champion sports franchises, as well as its position at the forefront of American history. Enjoy the waterfront with its pubs, restaurants and boutiques. Visit the Public Garden for a swan boat ride. Walk the Freedom Trail to discover the important sites in our nation's history. Culinary experiences are second to none in Boston, where authentic Italian and Irish cuisine meet mouthwatering seafood offerings in celebration of the many cultures that call this city home. Own A share of a yacht and a world of life-changing experiences. Please enter your information below to send a copy of the New England Guide to your email. AvYachts asks for information from users of its websites. Information gathered through its websites will be held in a database and will be used periodically to assist in the various marketing activities of AvYachts. AvYachts does not disclose users' information to any other third parties.